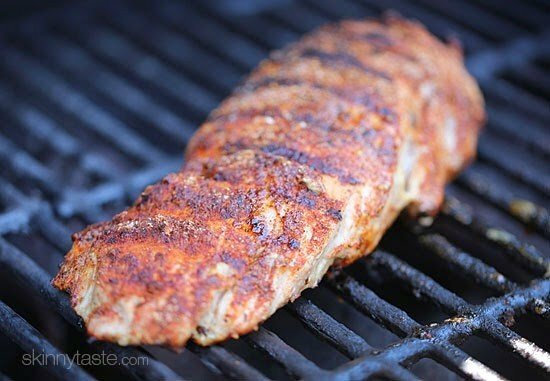 This easy Grilled Cumin Spiced Pork Tenderloin is perfect for summer nights. 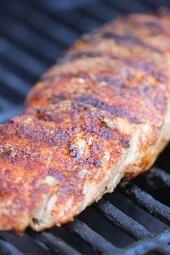 I season it with a quick, flavorful rub then throw it on the grill. While it cooks for 30 minutes, I make a salad and dinner is ready! Summer and warmer weather means grilling more and dining al fresco. Some of my favorite pork recipes are Fig Balsamic Roasted Pork Tenderloin, Quick Garlic and Lime Marinated Pork Chops, and Apricot-Rum Glazed Spiral Ham. Summer nights I want to stay out of the kitchen, and enjoy the great weather. With meals like this, it’s easy to do! 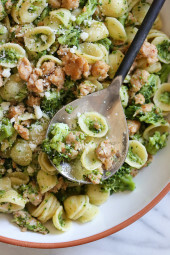 I like to serve this with salad, but some grilled corn or pasta salad also makes a great side! You can easily double the recipe to serve more. I find the best way to grill pork tenderloin is using this fool-proof method: I start by grilling the pork directly over the flame to sear and brown on all sides about 5 minutes on each side. Then I transfer the meat to indirect heat (which mean I shut the flame off one side of the grill) and let it continue cooking covered, until cooked through, about 25 minutes. Set aside and let it rest about 5 to 10 minutes before slicing. Grill or broil the tenderloin, covered on high 5 minutes on each side, then move to indirect heat if grilling, cover the grill and cook an additional 10 to 12 minutes, turning halfway, until an instant read thermometer inserted in the center reads 145°F* (about 22 to 25 minutes total). *Some people suggest taking pork off around 140°F. I prefer 145F so it’s a little pink in the center. The USDA health recommendations say that pork should be cooked to an internal temperature of 160°F. You can adjust this temperature to your own tastes and comfort level, especially if you know the pork is fresh. Very tasty. I cooked it on our large Weber grill for 5 minutes on each side as instructed and then 10 minutes in a pre-heated stoneware pan. This was probably a bit long for this grill. Next time I’ll either reduce the cooking time or lower the temp when baking on the grill.Otherwise it was very good! It’s fabulous but why is it 3 points? Shouldn’t it be 0 on Freestyle? 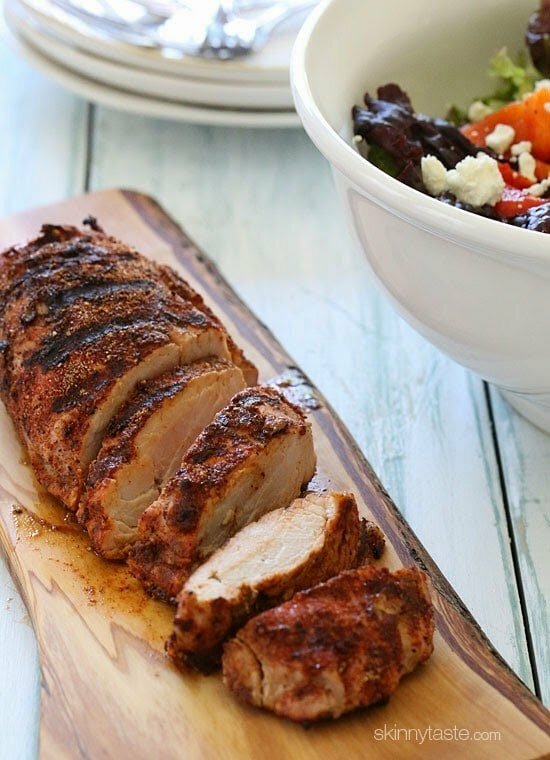 This is the best Pork Tenderloin recipe I’ve ever made! Thank you so much for all of your fabulous recipes. I am enjoying cooking for the first time in a long time! Loved this (kids too!). I paid close attention to the pork grilling instructions and this was the best grilled pork I’ve made. Thanks! 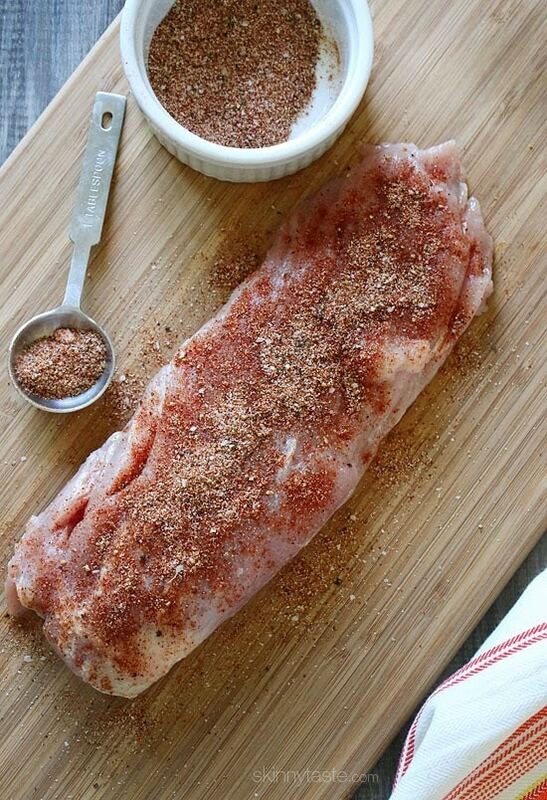 The seasoning of this pork tenderloin is amazing! Grilling directions are perfect. And it is all so easy! It will be in our meal rotation from now on. Made this today. I usually prepare a very similar rub, but without the cumin. My father entered the kitchen and said it smells Turkish, he doesn’t like cumin that much. Later he had to confess that he liked your recipe even better than our family recipe! So good, thank you! 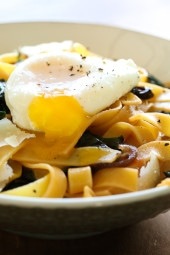 Great weeknight dinner when combined with the bean salad. My husband and kids loved it. FYI: In 2011, the USDA lowered the recommended temperature for whole cuts of pork from 160 to 145 with a 3 minute rest period. This is my favourite way to eat pork tenderloin. It’s always moist and sooooo delicious. Although I always use a meat thermometer, your timing (22 mins) is bang on for 145F. Thanks for the great recipe. Can you marinade this over night? the reason I ask is that rubbed the spices early in the day for tonight sdinner and plans got changed. This was amazing! And so easy. i couldn’t believe how quickly it was done and how good it tasted. My family – husband and twin 21 month daughters – ate like it was going out of style. When I broil it, should it be covered? I made this last night, and it was amazing!! I didn’t feel like using the grill, so I seared it on a hot griddle for 5 mins per side, then finished it in the oven for like 10 mins. I probably should’ve taken the temp then, because after I took it out of the oven, it was at 170. It was still very moist tho, and the flavor was crazy good! AND EASY!! This was amazing! Baked in 450 oven for 20 min, then 5 min broil. Delicious! Thanks, Gina! Love your website and your cookbook. Such an easy & flavorful recipe! I made it tonight with a salad for a quick amazing meal for my sweet Alexis home from college. Enough left over for my other daughter coming home late tonight. Thank you Gina! I made this tonight in the oven and it was really good. I broiled it for 5 minutes per side and then baked it at 450 for 20 minutes. It was very tender and juicy. I cooked this in the crockpot on low for 12hrs. The flavor was so good. This is a repeat recipe. If I use the broiling method, how long do I cook covered on each side? The instructions provided are geared towards grilling. Thanks. It’s usually about 20 to 25 min total. Where can I find the salad savors? I’d love to try it..
You can go to the DeLallo website to see where they are available. An outstanding recipe we have made numerous times. Great as is but I tweaked a little by adding 1 tsp maple sugar to the rub, and smoking it for 40 minutes with apple. I made this pork tenderloin for dinner tonight and it was amazing. I followed the directions to the letter and it turned out perfect. I was surprised that it only took about 1/2 hour from start to finish. Dinner was on the table waiting when my wife came home. I met her at the door with an electric lemonade and started carving the tenderloin. If you haven't tried this you should, it will make you a rock star in your families eyes. I used hot Mexican chili powder to give it that kick we like, but regular chili powder should be good too. Just made this for the first time. Grilled it on the bbq. Delicious! very easy too. Just want to let you know that I've made this numerous times and it has become one of my favorite ways to prepare pork tenderloin. It's so easy that I made it tonight in my toaster oven. Just set it to broil for 5 minutes each side, lowered to 375, surrounded with some apple wedges, cooked for 10 minutes, removed the pork and let it rest for 10 minutes as the apples mixed with the leftover juices and spices in the pan and finished cooking. The pork turned out perfect and the apples were a delicious side. So delicious and so easy! Husband, 1 year old, 3 year old and I all loved it. Thanks for another quick and tasty winner. Delallo's has only ONE store in the US that I know of. It is in a town called Jeanette, PA. My mom is from there and we have been going to DeLallo's ever since I was very little! If you ever want to take a road trip, the store will blow your mind! It is delicious! 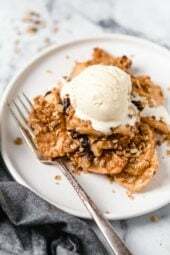 Great recipe – looks wonderful! Can you do this in a crock pot? If so, for how long? Would I broil it first before putting in crock pot? Thanks!!!! This looks like a great Father's Day item to make for dinner. I made this last night and it was delicious! I'm a huge fan of your blog! Thanks for so many great recipes. I've pre-ordered the cookbook. Super tasty! We baked this at 450 for like 20 minutes I think? Then broiled on high for five on each side, came out great. Done throughout, but not over-cooked. So good! Umm…yes, please. I want this for dinner tmmrw. I like using cumin so this caught my attention. Thanks! Pinning it!! 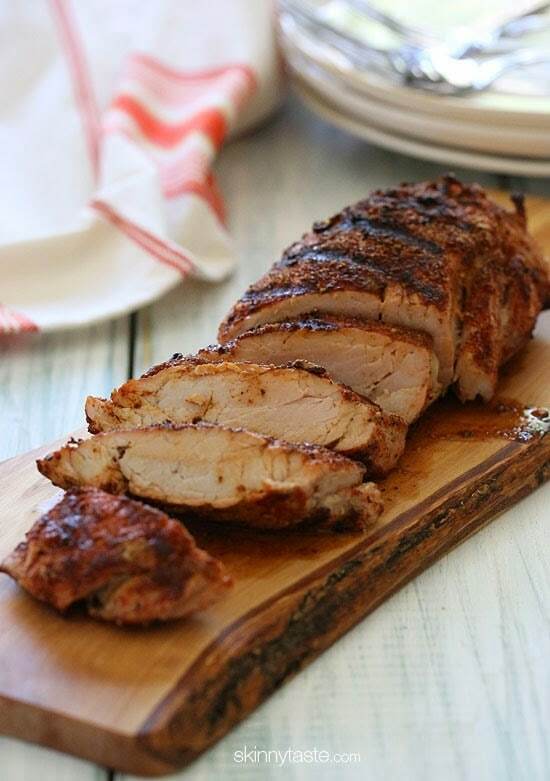 Your pork tenderloin sounds amazing! Delicious! Looks delicious!! I've never tried to grill pork tenderloin before, but I'm up for the challenge…lol. Thanks for the recipe! Do you know where you can purchase SaladSavors? they look fantastic. I love pork tenderloin. We get it at Costco and have it 2-3 times a month. I will definitely have to try the rub. Normally I put it in our deep dish baker and cook it in the microwave. It only takes 25 minutes and tastes great. That pork looks amazing and so tender! Definitely trying out this rub! Thanks for the recipe. I bought a pork tenderloin and have had it in the freezer. This looks flavorfull and delicious. If I make it in the oven I usually broil it so it gets browned, but you could probably cook it at 450F for about 20 minutes, use a thermometer to be sure it's ready. This was Top Chef stuff. I did the oven @ 450* for 25min, covered. Then I placed it in the broiler 5 min each side. My husband and I really liked it. I also liked that I had ingredients already in my cupboards. Oh man Gina this looks truly delish! Perfectly cooked and those salad topping are perfect for a weeknight! Great recipe for summer! I am loving SaladSavors! Can you bake this in the oven? Yes, you can broil it or bake it, just use a thermometer to know when it's done. I baked this evening. 350 for about 40 mins. Tender, flavorful, perfection! Mmmm I love grilled meat, it only takes a few spices and you have the tastiest of dinners!